DES MOINES – The Iowa Barnstormers have signed wide receiver Chris Robinson to the 2019 roster, Head Coach Dixie Wooten announced today. 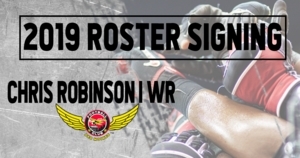 Robinson (5-8, 170, Southern Utah University) joins the Iowa Barnstormers for his first season with the team. Collegiately, Robinson began his career at Mt. San Jancito College where he spent two seasons before transferring to Southern Utah University. During his time with the Thunderbirds, Robinson appeared in 23 games earning the start in 14 where he collected eight touchdowns for 60 receptions and 880 yards. Robinson also earned All-Big Sky Honorable Mention. No stranger to the Indoor Football League, Robinson spent his rookie season with the Salt Lake City Screaming Eagles in 2017 where he appeared in 9 games.